Does somebody know more about this Nikon "D1" Protoype? It's time to share my respect on these gigantic Brontosaurs! 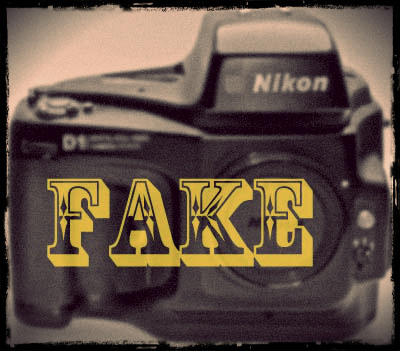 So please enjoy my two reports about the Fuji/Nikons and use Google Translate. For some reason, the photo of the D1 you are asking about doesn't seem to be there with two different browsers and devices. So, I am unsure what it is. I know there was a D1 which preceeded the E2. They decided to change from D to E with the second pass design. Later on, after the E3, they decided to reuse the D1 moniker on the quite different new design rather than call it the E4. Could this be what I can't see? Sorry for the wrong page! 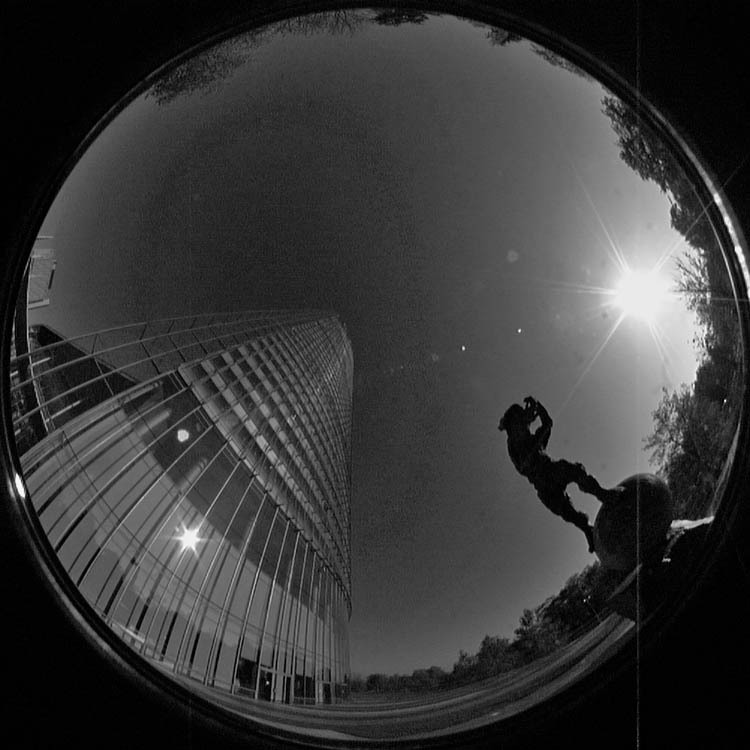 There you can see the only foto I know from the mysterious Nikon "D1" Prototype! Maybe also the Foto in mir.com is faked. 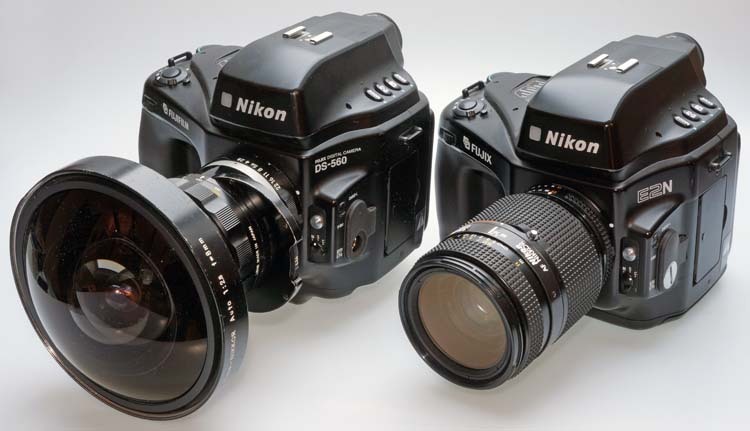 What do you think about the Nikon "D1" Prototype? Yes, that is the one I thought it might be. The D1 prototype is a actually the E1. They decided to use E for Electronic as opposed to D for Digital when they redesigned to the E2. Much later, they did a major redesign to a larger sensor and removed the optics - and every other part used in the entire camera - and decided to revert to D for Digital and begin anew with the number 1. Since they hadn't sold many, if any, of the original D1 before they decoded to redo it into the E2, they would have felt quite comfortable with the reuse of model designation. I have been known to do that myself from time-to-time. For example, in the 1970s, IBM had a PC series before the one most folks know of as the 'original PC'. But, we didn't yet use the term PC. We used numbers, and the first model was 5100. Followed by 5110, 5120 and 5130. The last in that series was the 5140, which was stillborn - meaning prototypes were made but no series production and sales of the 5140. It was killed off by the first of what was called the PC - the 5150. A short time later, I was involved in the development of a battery operated mobile variant of the PC called the Convertible. We gave it the stillborn model number 5140. So, in that case, we had a successor model with an earlier number. Decidedly unconventional. And, it meant that there were now two very different model 5140s out there. But, only one was sold and the other very likely only exists in a few development documents and maybe a photo or two. Just like the D1 prototype. Now it seems to be clear(er). This „D1“ ist a (Fuji(film)/Fujix) Nikon E1 – E ONE! The legend „D1“ on the only existing photo seems more and more fake to me! I had downloaded the „D1“-Prototype photo and examined this photo with „Unshake“ my secret weapon for restoring blurred, defocus blurred or too small photos. Beside the clearly recognizable "D1" Unshake found something illegible rotated by 90 degrees. And with some reliability I could recognize the terms „STILL“ and „VIDEO“. But analog (!) „STILL“ and „VIDEO“ does not match to “DIGITAL“. Back to your estimation: The D1 prototype is a actually the E1. They decided to use E for Electronic as opposed to D for Digital when they redesigned to the E2. E = Electronic could also mean STILL VIDEO! 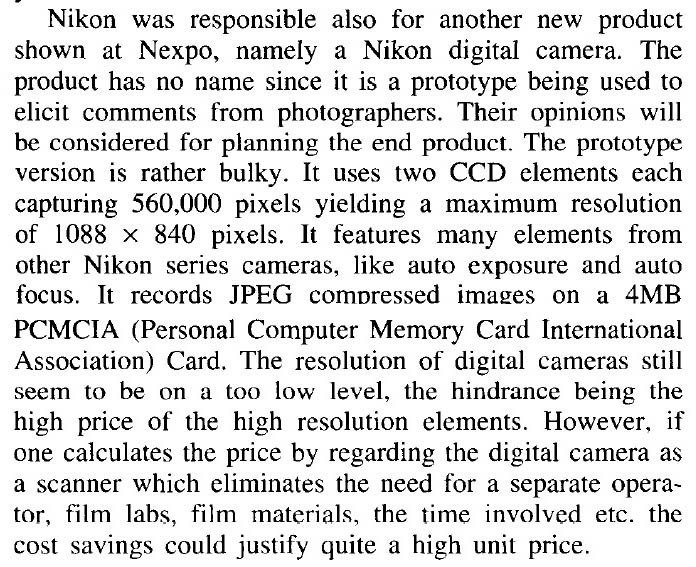 OK, reading the „ifra Special Report 6.13 – NEXPO’93“ text: „JPEGs should be stored on a 4 MB PCMCIA-Card,“ it MUST be digital. If it really had been Still Video, the 2 Inch Video-Floppy had been the choice of storage. I think it is DIGITAL. Thank you for your informations about this interesting Fuji/Nikon!